Basser's World Record Flight From the left: Curt Ungewitter, Rumpler Works Pilot, Flugzeugfuhrer No. 683 from 17.2.1914; Rekordflieger Robert Thelan, Flugzeugfuhrer Nr.9 from 11.5.1910; Hackstetter; Gustav Basser, with a floral wreath on his arm, Flugzeugfuhrer Nr. 354 from 24.1.1913; Rumpler; Werkmeister Schurer; Werner Wieting, Flugzeugfuhrer Nr. 312 from 15.10.1912 ( bildete als Fluglehrer u.a. Gunther Pluschow, den "Flieger von Tsingtau" aus); M. von Stoephasius, Flugzeugfuhrer Nr. 434 from 17.6.1913. 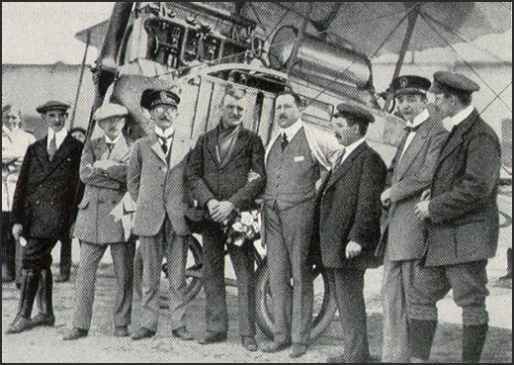 Gustav Basser had just concluded his world record flight, in a Rumpler of course! ONLINE RESOURCES - 1 If you search for "M. von Stoephasius", using the Google search engine, (10-30-04), you will not find any relevant links. However, the one immediately below does help. Pilotenschein- Nummer This page offers some basic details on M. von Stoephasius, as well as hundreds of other pioneer German aviators. Curt was identified in the photograph above as Pilot #434. You can find his entry by clicking on the title above and scrolling down to number 434.